In the recent issue of the Atlantic Monthly, Caitlin Flanagan, in an article entitled Cultivating Failure criticizes school gardens because she had a bad dining experience at Chez Panisse. Wow! Get over it Caitlin. Or at least do some research to find out what educational value schools find in gardening. You run into so many school kids that don’t know if a tomato grows on a vine, bush, or tree, or that you need flowers to get fruit, or even how bean seeds grow, gardening has to be educational. Apart from the fruits and veggies, gardening teaches many important lessons in life: a good work ethic pays off, so does being responsible, planning is important, working together is a good thing, patience is necessary, this is where food comes from, and sometimes even your best efforts end up in failure, but next year you try again. Gardening is a real experience, and as such can be used to as a basis for many important lessons. One of them is that you can often learn more from doing something real that’s sort of fun than you can from studying for standardized exams. What a dreary nose-to-the-grindstone view of education ol’ Caitlin has. Wonder if she learned to write by diagramming sentences? The Phactor very much doubts it. Caitlin went shopping in the hood, but she should have picked up a hoe and planted some beans. And typical enough of people who don’t garden, they just don’t get it, and isn’t that always the way when it comes to such criticism, it is almost always based on utter ignorance. So we can only hope and wish that the Caitlins of the world try to grown themselves a garden, with the help of 4th graders, and then try to tell me gardening is not a worthwhile educational activity. Treehugger has posted a very nice response pointing out the fallacies portrayed in Cultivating Failure. The Phactor hopes gardeners out there share his rage, grab a pitchfork, and turn some mulch, but do not fail to let Caitlin and the Atlantic Monthly know they are spreading manure. Nothing is more annoying than those sleasy people who leave faux comments on your blog that are actually advertising with links to their products thereby using the Phytophactor's blog content to drum up business for free. So here is the latest sleasebag comment deleted from the previous blog. "Nice work, your awsome content have forced me to to leave some positive feedback BioBizz TopMaxIs Best for Flowers & Vegetables"
We'll kindly not point out the poor grammar, spelling, and weak sentence structure. So here is my message to readers about BioBizz TopMax: this is a product to be avoided because it is being marketed by sleasy people. This means there is a very good chance this product is a green-scam of limited value and overpriced. After all, they use marketing tactics that indicate they would do anything for a quick farthing, so what else is one to think? Have a nice day. One of the annual March chores is doing battle with the raspberry bramble. The reason for this is simple: the aerial shoots (canes) of red raspberries have a biennial cycle. In their first year new canes remain vegetative and unbranched, growing into long whips and over wintering in this condition. In their second year, raspberry canes branch, flower, and fruit, and then these shoots die as the season ends. This means you have to do two things each spring: one, remove all of last year’s dead canes, and two, cut all of the year-old canes back to about two feet tall to promote branching, flowering, and fruiting, and less flopping of fruit laden canes. This means you have to make sure you can tell the difference between live one-year-old canes and dead two-year-old canes; this sounds easy, but people screw up easier things than this. Every time you make a mistake, you shoot yourself in the berry basket. All of this is made more fun because the canes tend to tangle together and they’re armed with prickles (yes, this is a technical term for smallish thorns). Now these prickles are nothing compared to the thorns on climbing roses, and those are nothing compared to climbing rattan palms, but the joy and the bleeding are there. 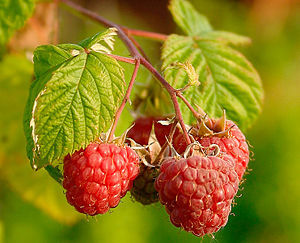 Other than this red raspberries are a pretty carefree, reliable, bountiful, and delicious crop, except of course once you realize you must establish a de-militarized zone, preferably a mine field or retired star wars laser cannons, where any entering raspberries get vaporized. Or as an alternative to bramble warfare, let them spread into the neighbors’ yard. The Botanical Society of America is now posting links to botanical blogs written by its members! The Phactor wonders who gave them that idea? And of course there are links to botanical news, essays about careers in botany, student essays about studying botany, a whole bunch of botanical images, in addition to the scientific stuff. Some of my readers may also be interested in the Planting Science program of connecting scientists to grade school students trying to design and conduct experiments on plants. Too bad botany continually gets the short end of the biological stick here in the USA. It's spring here in Lincolnland and this is the time for action. First, now is the time to begin a flowering log for your garden to keep track of what and when everything flowers. Such a log will show you when and where you have flowering "gaps" and the beginning of data that can be useful for showing changes in the flowering season. Such data kept for over a century (and this is why you should start as soon as possible) have shown significantly earlier flowering in the northeastern USA, a trend consistent with a warming climate. The Phactor has never done this himself formally, and it will be a challenge what with several hundred flowering plant species to keep track of (150+ trees and shrubs & who knows how many perennials). Second, now is the time to begin ignoring your lawn. This can never begin too early. Avoid the temptation to buy all that high nitrogen lawn fertilizer all the stores have in stock. If you must spread something to keep the neighbors from staring, spread milky spore to provide a biological control of Japanese beetle and other lawn grubs. At most sow some seed on bare spots. If you start your lawn out early on a fertilizer diet it will expect water and nutrients all summer long, and rather than having your lawn go dormant in the heat of summer, as it should, you will be out there mowing, harvesting all that inedible biomass, a wretched excess caused by your own exuberance and misplaced energy. Think of the money you will save and buy yourself some new plants so the garden shops don't go under. Remember, a monoculture of grass just is not very interesting, not sophisticated aesthetically, and not ecologically stable. Poor Chicago, The Daily Beast ranked Lincolnland's numero uno city only 25th on their list of USA's craziest cities, and in my own estimation it shouldn't be anywhere that high. But what little factoid did they use to amuse everyone about Chicago? The Lakeview Museum's large scale solar system! Neato! Except the Lakeview Museum is in Peoria, Illinois some 130 miles SW of Chicago. What maroon decided to use this particular factoid? Think they looked at a map? Think they read the link they provided which clearly indicates the museum's correct location? Scheesh! Well, there are lots of good museums in Chicago folks, just not this one. If a plant is green, why be carnivorous? And if a plant if carnivorous, why be green? This was a central question surrounding the phenomenon of carnivorous plants. And science has known the answer for a long time. Plants are awash in nitrogen (70% of the atmosphere), but plants can’t use gaseous nitrogen, and lack of this critical nutrient often limits plant growth. Some plants use bacterial symbionts to help them acquire nitrogen, e.g., legumes-Rhizobacter; mosquito fern-Anabaena. But carnivorous plants use their various trap devices to capture animals and acquire nitrogen from the digestion or decomposition of their bodies. 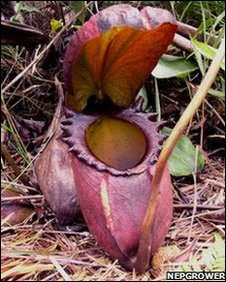 Since its discovery people have thought that the giant pitcher plant of SE Asia caught really large animals, things like mice, which for a plant is pretty large prey. Nice idea, but the "body" of evidence was always lacking. It turns out that this pitcher works in a different way. 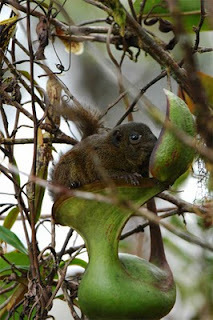 By positioning a nectar reward on its lid, small mammals like tree shrews are positioned such that when they defecate, the “results” end up in the pitcher. And when you think about it, this particular pitcher does sort of look like a toilet. So this is one more way plants interact mutualistically with animals to acquire needed resources, but you can decide what to call this since it isn’t really an animal-eating plant anymore. It's official! Spring is here! The Phytophactor doesn't much care for the calendar designations of the seasons. What matters is what the garden and gardener do. While taking my morning coffee, spring was declared because the witch hazel (Hamamelis) out beside the garage was in full , cheerful yellow flower. Witch hazels will bloom reliably when every other shrub is nothing more than bare naked twigs, some in the late fall (November) and some in the spring (March). This year the witch hazel even beat the snowdrops for first to bloom. Another witch hazel variety beat this shrub by a week or more, but it's a young plant and only had a couple of flowers after the rabbits pruned it so thoroughly during the winter. Witch hazels also have nice fall color and the grow well in shady areas. Not to be out done, the Phactor planted spinach, lettuce, and mustard salad greens in boxes that went into the cold frame greenhouse. Any time the daytime temperatures are at or above freezing, cold tolerant plants will grow quite nicely in a cold frame heated only by trapping solar energy. This is a great way to extend the salad season by two months a year (spring and fall). So come on people, what are you waiting for? Spring is here! An interested reader writes, "Are mushrooms plants?" Mushrooms are fungi, and fungi are not plants, although this is a bit more of a problem that you might imagine. First off, biologists have known that fungi were something quite apart from plants for a long time, but what happened was that in terms of teaching and academic departments, biology was divided up into zoology, the study of animals, and botany got everything else, and that not only included the fungi, but bacteria as well. In modern day biology, the old taxonomic concept of kingdoms is not faring so well, nor for that matter is the whole taxonomic hierarchy. However, let me stay on task. Fungi do form a single lineage, a group that shares a common ancestry, and this lineage conforms to what many mean when they refer to Fungi as a kingdom. The same may be said for animals, and interestingly enough, fungi and animals are each others closest relatives. That is, they share a common ancestry too somewhere back among their unicellular ancestors. See how similar these two pink-orange critters are? So as bacteria and fungi were recognized as distinct groups, the old catch-all plant kingdom got smaller, and even more so when about 45 years ago, even all the algae were removed (and placed within a grab-bag kingdom of protists) leaving behind nothing but the land plants. No question land plants form a single lineage, but they share a common ancestry with a small group of green algae, and then a more general common ancestry with the rest of the green algae. So where do you draw the kingdom line? This is part of the reason why the concept just isn't all that useful anymore. And there are even more green organisms out there that are only very distantly related to plants, things like the chlorarachniophytes, little spider like green amoebae. Wow, where did the week go? Here's the February round up of plant blogs, Berry-go-Round #25, a virtual valentine for plant lover's over at Foothills Fancies. Life is like a box of chocolates. You hear a lot about March madness around this time of year, thus the March part, and apparently the maddness deals with that particular pre-spring mental disorder that finds a sport where tall men in baggy drawers bounce a rubber ball back and forth interesting. There are no sticks and no hitting, so one wonders how it can even be called a sport, but perhaps it’s just the boredom of a long winter setting in where anything more dynamic than melting icicles seems interesting. Maybe this is related to that old malady called cabin fever, that feeling that you’ve been cooped up and hibernating for too long, and like a big ursid short on caffeine you tend to wake up grouchy and feeling like you’d like to take a big clawed paw and knock something silly because you’ve been putting up with it (fill in the blank) all winter. But for many of us it’s not March madness or cabin fever, but a seasonal occurrence of GDD, gardening deficit disorder, that sense of urgency that begins to invade your psyche, aided and abetted by mail order plant catalogues, a sense that time is a wasting and if you don’t get outside and scratch in some soil soon you’ll go crazy and if you don’t get the garden going you won’t have any salad greens until May, an unacceptable lateness, and this can be especially bad if you happen to cohabit with someone who’s afflicted with March madness, thereby adding insult to injury. The hints of spring are everywhere even though winter’s grip on the landscape has been tenacious this year. Snow still covers the majority of the estate, but the witch-hazel has begun flowering although most people would walk by the tawny orange-brown flowers without noticing. And under the snow the thousands and thousands of scillas that form a blue blanket across the lawn are poking up their shoots and blue buds that only await a couple of days above freezing to open. When you go out scouting for these earliest signs of botanical activity, and you cannot walk past a display of seed packets without a gander, you surely have all the signs of GDD. Unfortunately this still calls for a bit of patience, or a heated cold frame, before you can begin gardening in earnest. So until then you simply must endure wating for the last dregs of winter to slowly wane with little to ease your longing, unless maybe you plant the TV remote deep in a potted plant. Or is this just the grouchiness of GDD talking? At least the professional winter sports have the decency to so greatly prolong their seasons that you simply do not care anymore one way or the other, and like a naggingly painful toothache or headache, you just want it to be over. Yes, that’s the GDD talking.